19 December - 12 April, 27 May - 27 September. You will receive a good welcome in English from the Baur family at this beautifully maintained and picturesque site, situated at the foot of the Aravis mountain range. There are 149 pitches with 123 for touring. Of average size, part grass, part gravel they are separated by trees and shrubs that give a little shade. All pitches have 2-10A electricity and 86 are fully serviced. Rock pegs are essential. A 200-year-old building houses a bar/restaurant decorated in traditional style and overlooks the indoor pool. It offers regional dishes in a delightful, warm ambience. The village is 200 m. away and has all the facilities of a resort with activities for both summer and winter holidays. In summer, a variety of well signed footpaths and cycle tracks provide forest and mountain excursions. In winter the area provides superb facilities for downhill and cross-country skiing. 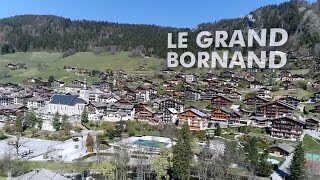 This very popular campsite, set beside the picture postcard ski resort of Le Grand-Bornand, has wonderful views and is surrounded by fields of flowers in summer. Good toilet blocks (heated in winter) have all the necessary facilities for disabled campers. Drying room for skis, clothing and boots. Superb pool complex with interconnected indoor (all season) and outdoor pools and paddling pools (1/7-30/8), jacuzzi and water jets. Cosy bar/restaurant and takeaway (all season). Play area. Tennis. Activities for adults and children. Video games. Discounts on organised walks and visits to Chamonix/Mont Blanc. Traditional chalets and mobile homes to rent. WiFi in some areas (free). From Annecy follow D16 and D909 towards La Clusaz. At St Jean-de-Sixt, turn left at roundabout D4 signed Grand-Bornand. Just before village fork right signed Vallée de Bouchet and camping. Site entrance is on right at roundabout in 1.2 km.